1995 Fadal VMC3016HT mdl. 904-1 4-Axis CNC Vertical Machining Center s/n 9504589 w/ Fadal CNC88HS Controls, 21-Station ATC, CAT-40 Taper Spindle, Rigid Tapping, High Speed CPU, Graphics,240V, 16” x 36” Table, Coolant. 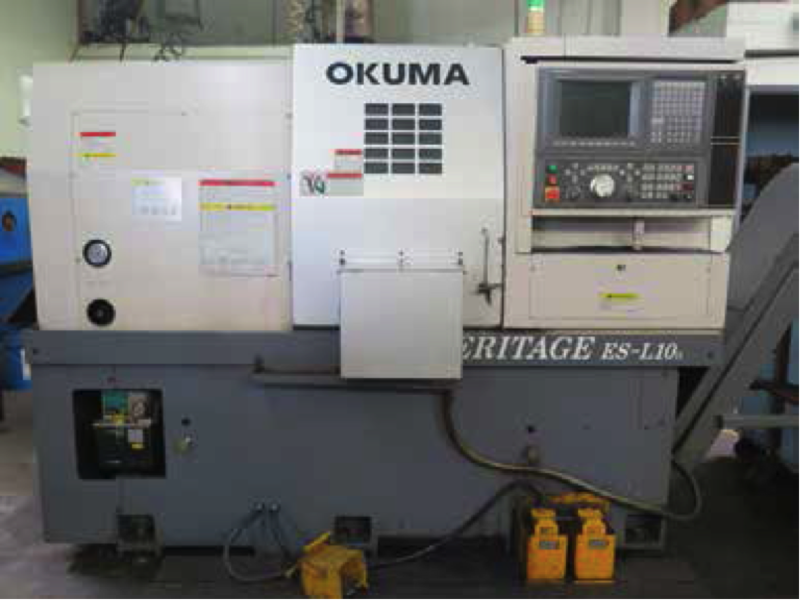 Okuma Heritage ES-L10 II CNC Turning Center s/n P0320 w/ Okuma OSP-U10L Controls, 12-Station Turret, Hydraulic Tailstock, Parts Chute, 10” 3-Jaw Power Chuck, Chip Conveyor, Coolant. Okuma Cadet Type LNC-8 CNC Turning Center s/n B024 w/ Okuma OSP5020L Controls, 12-Station Turret, 8” 3-Jaw Power Chuck, Coolant. Okuma LC-40 CNC Turning Center s/n 55020155 w/ Okuma Controls, 12-Station Turret, 15” 2-Jaw Chuck, 12” Power Chuck, Chip Conveyor, Coolant. Okuma LC-30 CNC Turning Center s/n 55020135 w/ Okuma Controls, 12-Station Turret, 10” 3-Jaw Power Chuck, Chip Conveyor, Coolant. LeBlond Servo-Shift 15” x 32” Lathe s/n 4C901 w/ 45-1800 RPM, Inch Threading, Tailstock, 6-Station Turret Assy., KDK Tool Post, 8” 2-Jaw Chuck. Lagun FT-1 Vertical Mill s/n SE-3115 w/ 2Hp Motor, 55-2940 RPM, 8-Speeds, 4” Riser, Power Feed, 9” x 42” Table. Max-O mdl. KGS-200 6” x 14” Surface Grinder s/n 780923-3 w/ Magnetic Chuck, Wheel Dresser, Coolant. Continental mdl. 100M 10” Horizontal Band Saw w/ Manual Clamping, Stop, Coolant, Conveyor. Nugier H40-14 40-Ton Hydraulic H-Frame Press s/n N1960031 w/ Enerpac Electric Hydraulic Unit. (2) Burr King mdl. 562 1” Belt Sanders. Apex 20” Pedestal Disc Sander. Craftsman 180 Amp Arc Welder. Kellog 10Hp Horizontal Air Compressor w/ 80 Gallon Tank. Chicago 14” Abrasive Chop Saw. Portable A-Frame Gantry w/ Chain Hoist. Cantilever Material Racks, Pallet Racking, Storage Shelving and Work Benches. Fadal VH-65 4 th Axis 6 ½” Rotary Head s/n 6431195. (35) CAT-40 Taper Tooling, (2)Kurt 6” Angle-Lock Vises, 6” Speed Vise, 7 ½” Machine Vise, Hartford 8” 3-Jaw Indexing Chuck, 5C Speed Chuck, 15” 2-Jaw, 10” 4-Jaw, 10” 3-Jaw Chucks, (2) 5C Indexing Heads, 5C and R8 Collets, Insert Turning and Boring Tooling, Drills, Taps, Reamers and Endmills. MicroVu mdl. M14 14” Floor Model Optical Comparator s/n 3428 w/ Acu-Rite Master-G DRO, Surface and Profile Illumination. Enco mdl. NR Rockwell Hardness Tester s/n 78/400, Johnson Gage mdl. 3-C- 1 Group “C” 1.5”- 3.0” Dial Roll Thread Pitch Gage, HDT Gage Block Set, Mitutoyo 15”-16”, 11”-12”, 9”-10”, 7”-8” OD Mics, Mitutoyo 2”-4”, 1.4”-2.4” Dial Bore Gages, Mitutoyo 3”-4”, 0-1” Blade Mics, Mitutoyo 0-1” Tri-Mic, Starrett 0-1” Step Mic, Mitutoyo 1.5”-12” ID Mic, NCK ¾”-1 ¾” Dial CaliperGage, Mitutoyo Digital and Dial Calipers, 24” Vernier Caliper, Thread Ring and Plug Gages, V-Blocks and Angle Plates, Mitutoyo and Granite Indicator Stands, 48” x 48” x 6” 4-Ledge Granite Surface Plate w/ Stand.